A Literary Odyssey: Book 67: Book Stats and The Metamorphosis. Other Works Include: The Trial (1925), The Castle (1926), Amerika (1927), and many essays, etc. I am slightly intimidated by anything that has its own label (I am speaking of the term "Kafkaesque"). That's intimidating and tells me that I might not get all out of the writing that I should (says some scholars). But this story has always intrigued me and the little I know sounds like a cheesy 80's horror flick. A man wakes up to find himself transformed into a bug of all things. How can this be literary genius? I suppose that is what I will find out. I should point out that at some point in the future I am also reading The Trial, which I hope is not about insects. I was definitely not a fan of the Metamorphosis, but I really enjoyed 'The Trial'. Both books, however, are permanently imprinted in my mind... so there is that. I wouldn't worry that much about the style, though, keep in mind that the trial seems to go on and on... something that Kafka probably intended. I adored this novella! We read it in school and learned so much about the underlying symbolism. 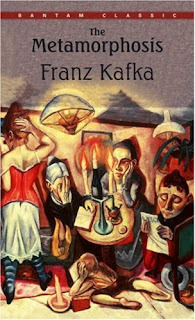 It turned Kafka into one of my favorites. I read it in a humanities class in college. I remember enjoying it but thinking it was a little odd. I'll have to read it again. I didn't realize it was that short. When I was thinking about it the other day, I assumed I had just read an excerpt for my class, but I guess it was the whole thing. I haven't read 'Metamorphosis', but loved 'The Trial', so perhaps I should give this one a try. Is it in any way linked to Ovid's 'Metamorphosis'? I read this one in high school and remember being slightly creeped out by it. Not so much because I don't like bugs but because I found it to be rather sad, I think. I actually just acquired (and by that I mean dug up from the bottom of my dad's closet) a collection of Kafka stories. I haven't worked up the gumption to start it though. It is a great story. So creepy and sad and just plain wonderful. I think it lends itself to how the term kafkaesque came about, which makes me enjoy it all the more. :) Have fun reading!